#Bougainville Communications and Media report : We need to improve awareness activities on the peace agreement and upcoming referendum. Government research conducted across Bougainville has laid the foundation for more targeted public awareness. 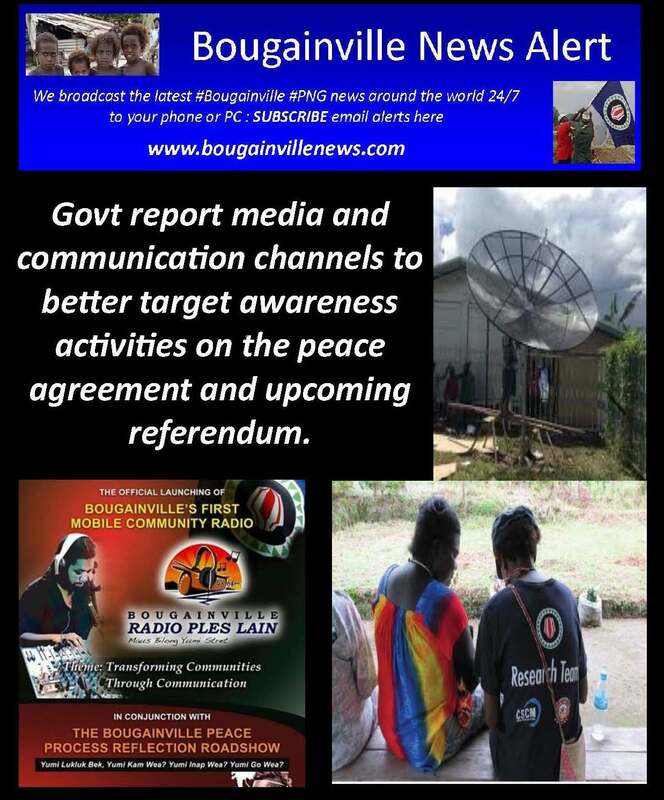 The Autonomous Bougainville Government has released a report on people’s access to media and communication channels to better target awareness activities on the peace agreement and upcoming referendum. The report is based on a survey of over 1,000 people across Bougainville. It found that the varying, but generally low access to government information required new approaches with greater attention to presentation of information. The report recommended tapping into new channels people are using such as mobile phone and video, but a general need to focus on the content of information with clear, simple and consistently repeated messages, designed with the target audience in mind – whether they be youth, women or people of different levels of literacy. conducted by the Centre for Social and Creative Media , University of Goroka. Chief Secretary Joseph Nobetau thanked Bougainvilleans for their participation in the survey and assured them that the government was listening to their voice. “This survey has gone down to the grassroots level to find out why awareness of the BPA and government remains low”, Nobetau said. The research showed there was still confusion about key aspects of the Bougainville Peace Agreement. People said they wanted the government to come down to their level, invest in radio, but also suggested new ideas, like using mobile phone for information dissemination. Mr Nobetau said while the survey showed there is a lot of work to do to prepare people for the referendum, it also gave many good ideas about how to do things better. The head of the Bureau of Media and Communications Adriana Schmidt, said they were already responding to the findings. “We are currently working with the Department of Peace Agreement Implementation to prepare multi-media information kits for our Members of Parliament, producing video and investigating mobile-phone based awareness,” Ms Schmidt said. The Chief Secretary called upon all government agencies and communication partners to use the report to improve engagement with community. The Bougainville Audience Study asked people about their access to radio, mobile phone, TV, newspaper and the internet, their most trusted sources of information, and preferred ways of receiving government news. The research also asked people about their level of understanding of the three pillars of the Bougainville Peace Agreement: weapons disposal, autonomy and referendum, and other issues. conducted by Centre for Social and Creative Media , University of Goroka, with funding support from the governments of Papua New Guinea, Bougainville, Australia and New Zealand. Over 1,114 people were surveyed, and 200 in-depth interviews conducted.